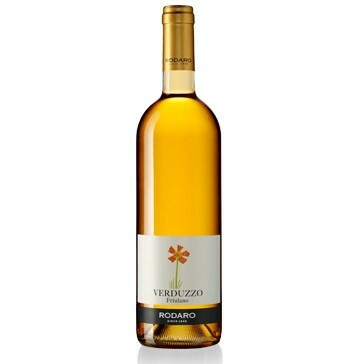 This wine is the valued result of the careful and exclusive selection of grapes of the Verduzzo Friulano variety, grown on hillsides owned by a small family company. These vineyards benefit from a highly individual local climate. The grapes are collected when they are over-ripe. After fermentation the wine is laid in bottles for at least two months. It is a golden yellow colour and has a delicate aroma that is reminiscent of violets and bitter apples. It tastes full and sweet with delicate tannins. Rodaro is a small rural company in the heart of Colli Orientali del Friuli, north-east of Italy. The Rodaro family devoted themselves to grapevines cultivation since 1846. For almost a century the wine produced was sold by the family, which at that time ran a small rural osteria. They had to wait until the introduction of a tractor and several pieces of machinery in the 1960s before they could fully exploit the potential of their vineyard. In fact, up until this period all work in the vineyard was carried out by hand. The family's love of the land and their desire to do better has seen an increase not only in the amount of wine produced, but also in its quality. Their working techniques take into consideration two important factors for the production of quality wines: modern equipment and ancient wine-making traditions, with the result of a typically varied collection of wines that are highly individual for the area they come from and can often be aged for a long time. The company has a vine-growing area of about 60 hectares and all the grapevines are situated in best position, with a planting density of 4,000 - 5,000 vines per hectare. They are cultivated according to the traditional "cappuccina" system with 8 - 10 fruit-bearing buds per vine. The company also runs a small nursery where several varieties of vine in danger of extinction are raised. Buds are collected for breeding purposes from some of the oldest vineyards in the area. This practice means that species of vine which would otherwise no longer exist can be studied and cultivated. This wine is a good accompaniment for baked desserts and fruit tart. The wine should be served at 14 degrees centigrade in clear, transparent crystal goblets. This isn't a wine to age and should be drunk within five years of purchase at the latest. The bottles should be laid horizontally in a cool, dark, humid wine-cellar.